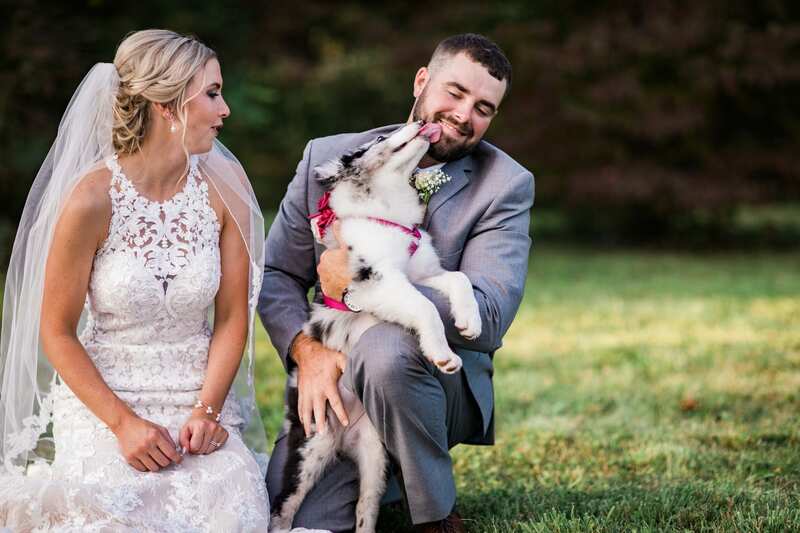 Rachel and Justin had an unusual guest for their farm wedding in Southern Western Virginia: their Australian Shepherd puppy, Grace. 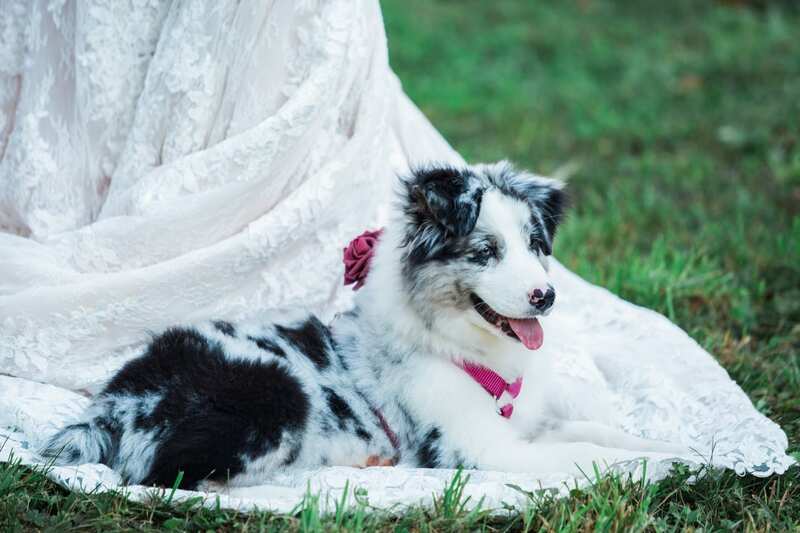 Only a few months old, many might be concerned about inviting a puppy to a wedding. 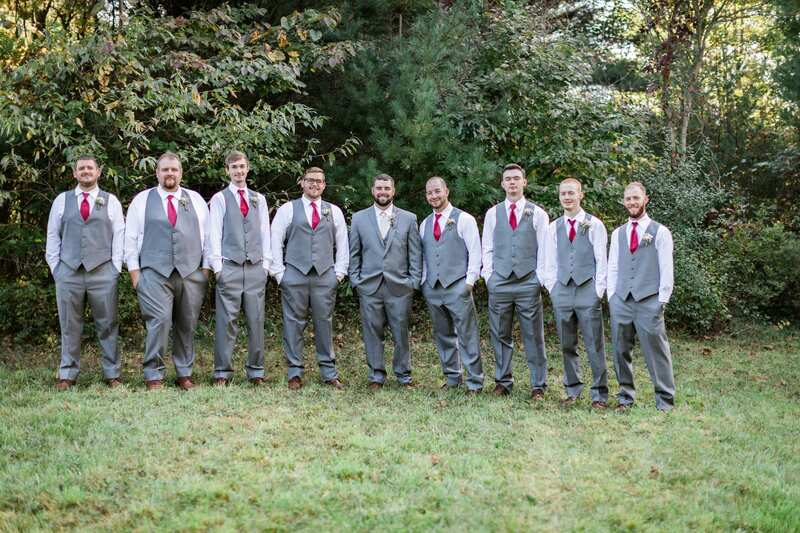 But Grace actually walked alongside the bridal party and stayed leash free the entire evening. 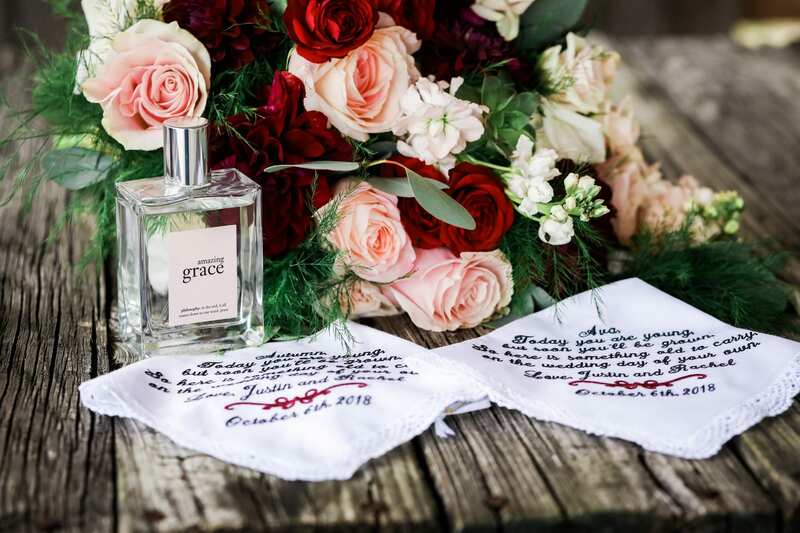 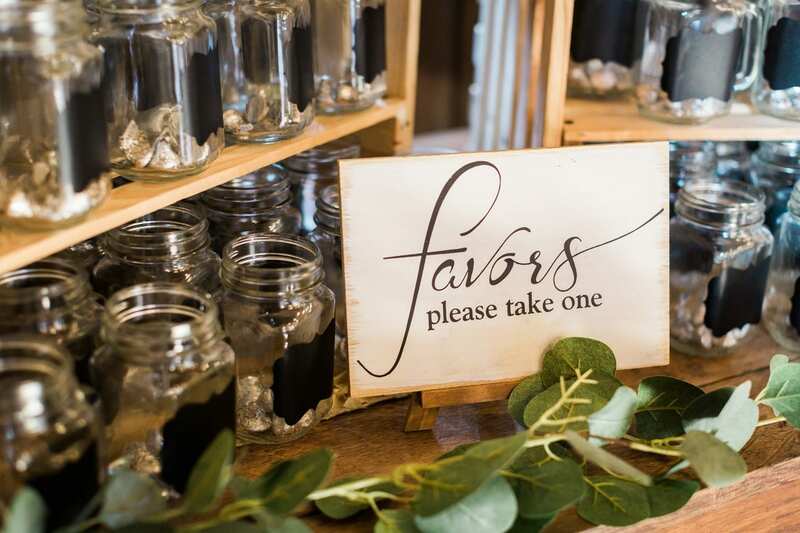 There was plenty of other whimsical notes in Rachel and Justin’s wedding, captured with charm by Jasmine White Photography. 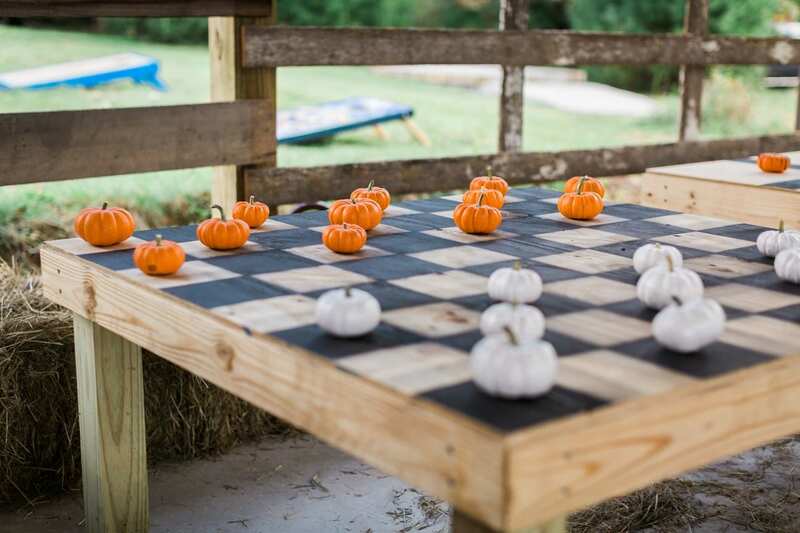 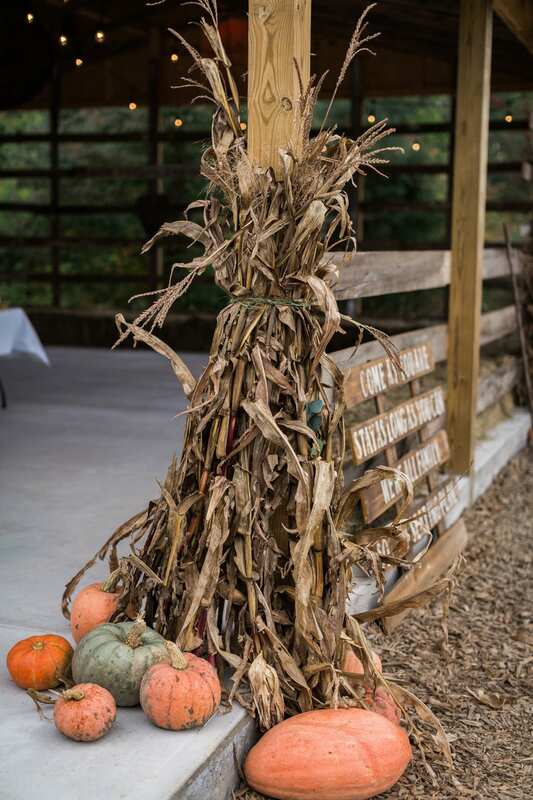 A fun autumnal theme was evident in the mini pumpkins that lined the outdoor space and games with checkers. 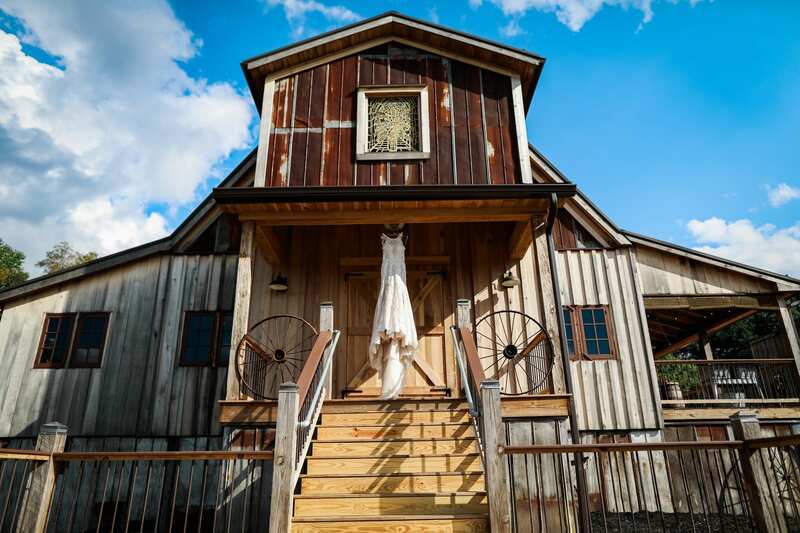 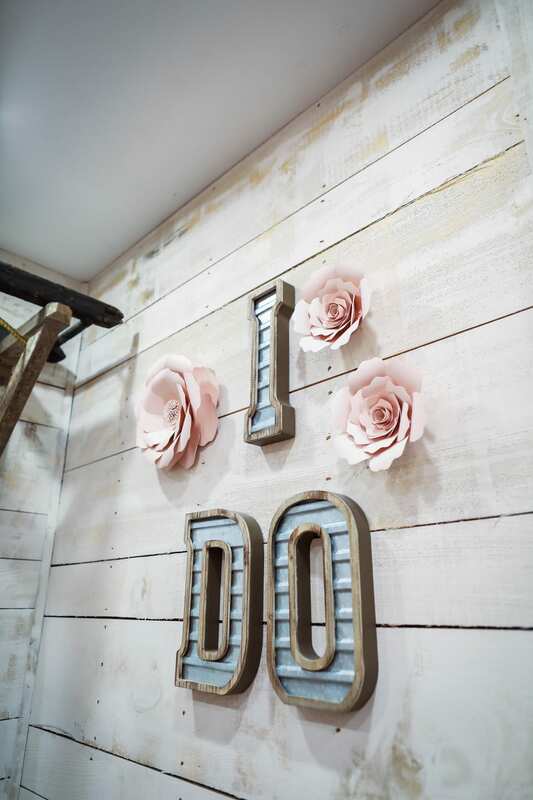 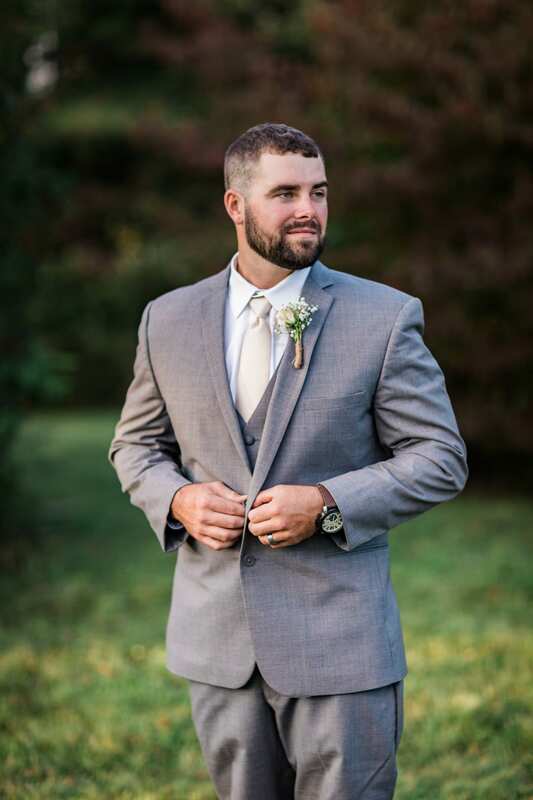 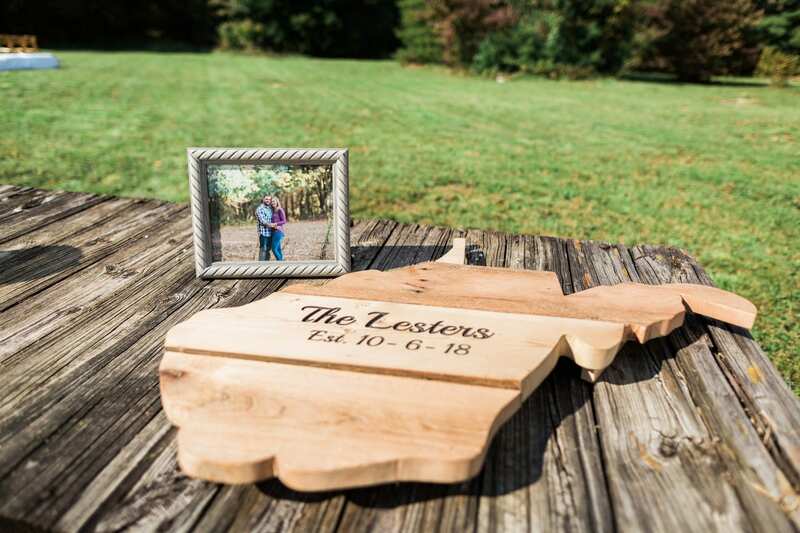 Rows of fold out chairs led to a wooden archway, where Rachel and Justin exchanged vows before a priest. 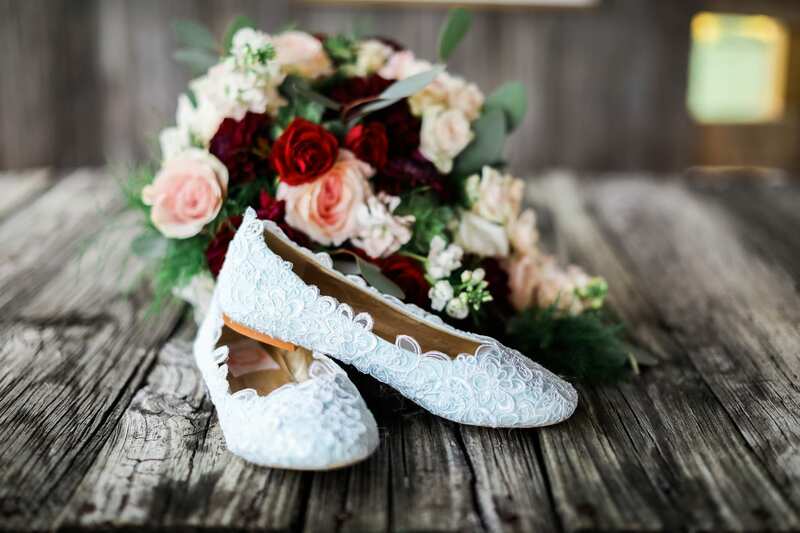 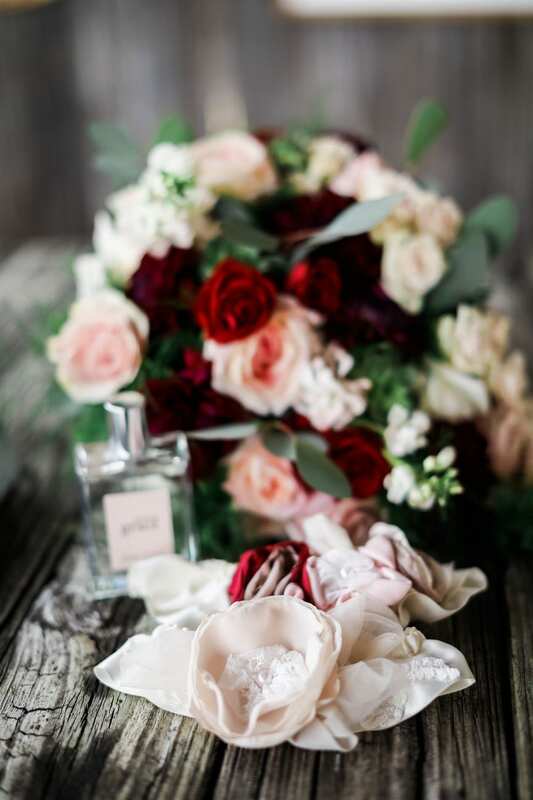 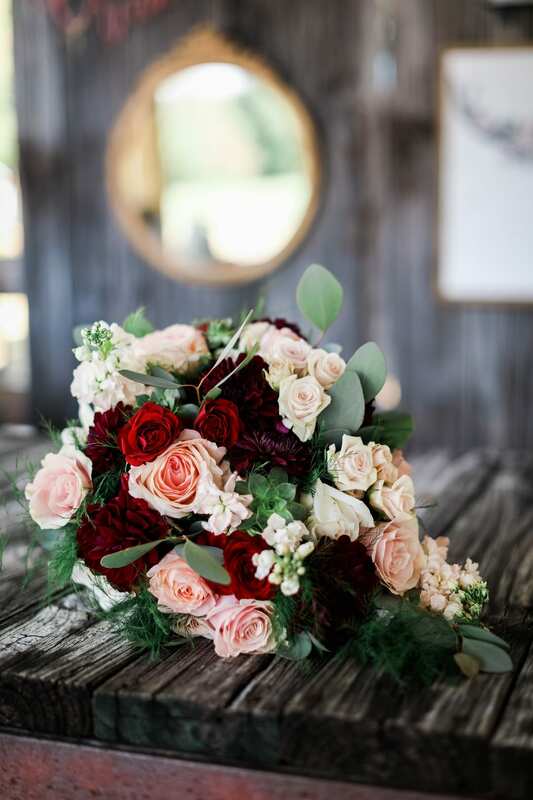 The bride got ready with her bridesmaids in a room filled with soft rose petals scattered across the floor. 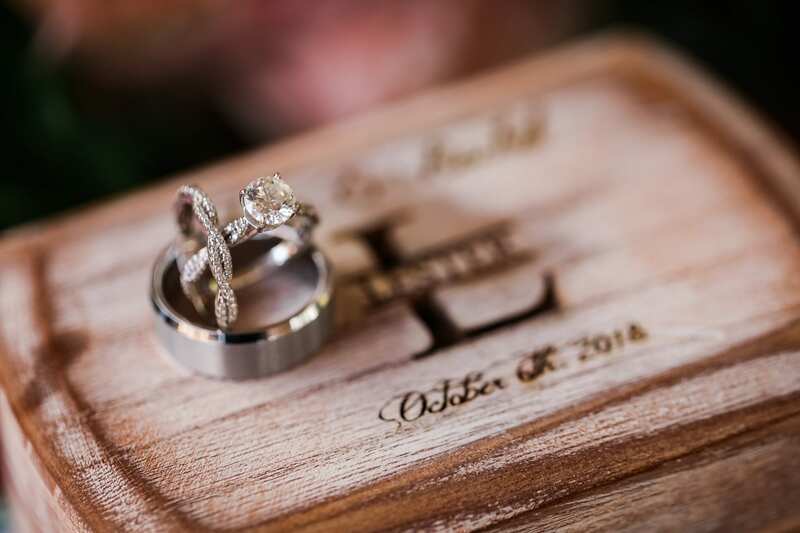 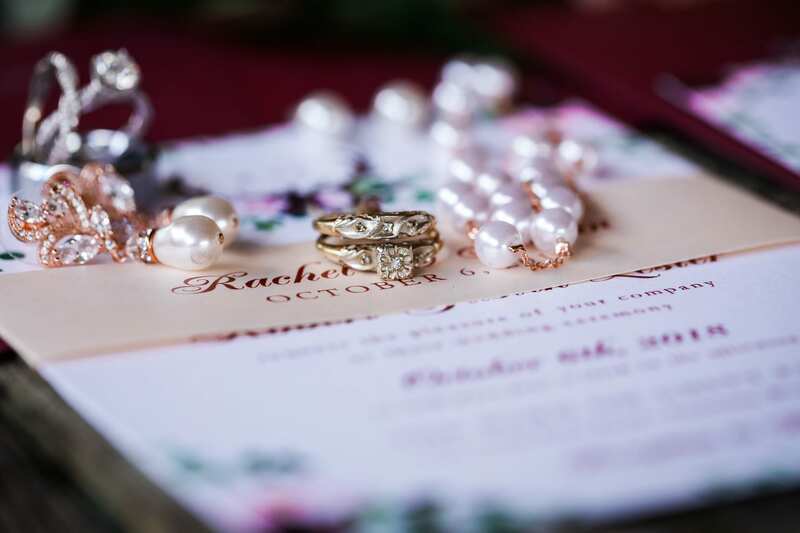 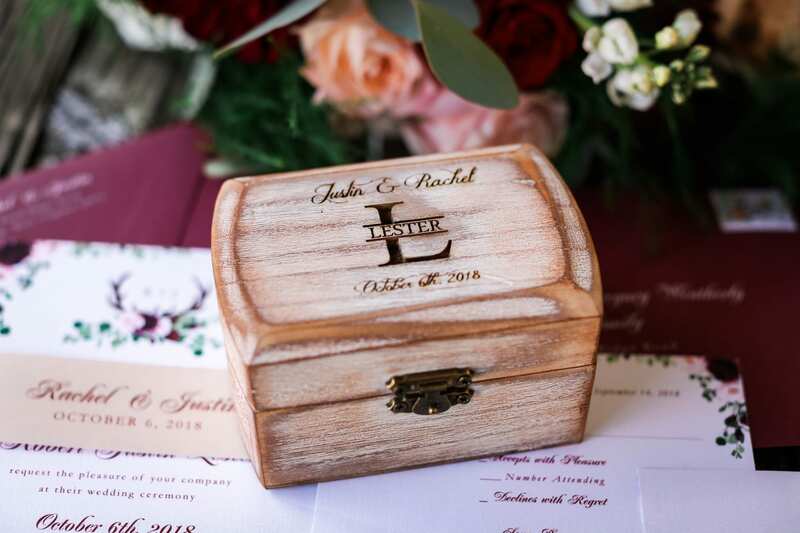 The bridal rings were kept safe in a wooden jewelry box. 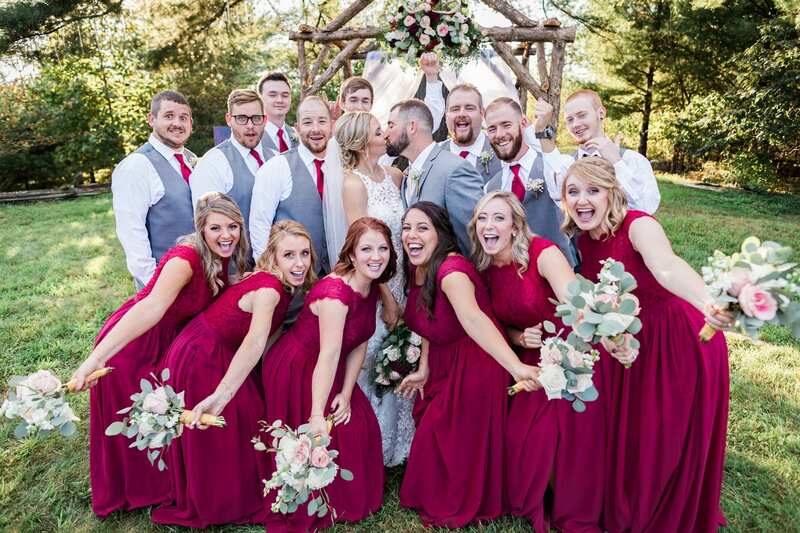 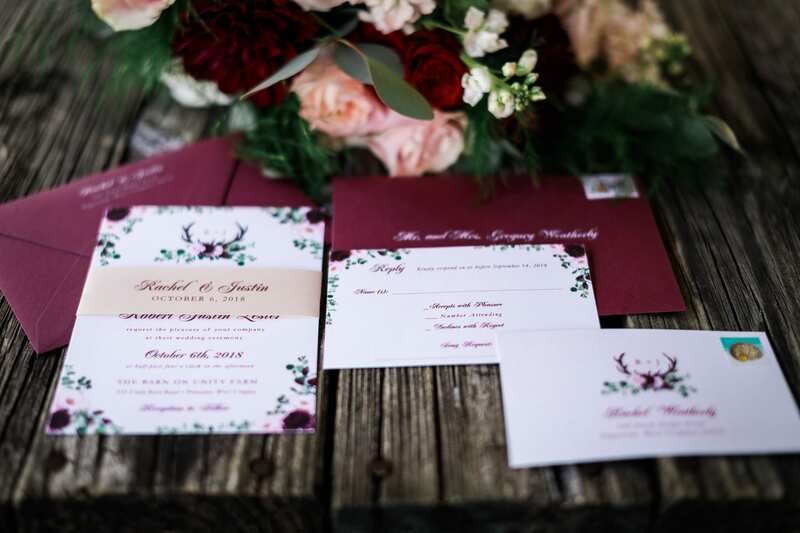 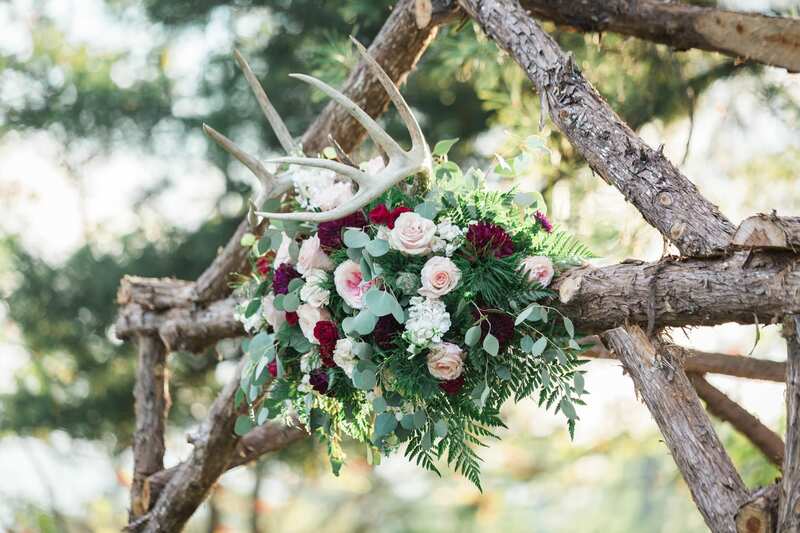 Crimson red bridesmaid gowns and gray afternoon suits played with rustic and fall themes but added unexpected pops of color to the naturally lush landscape. 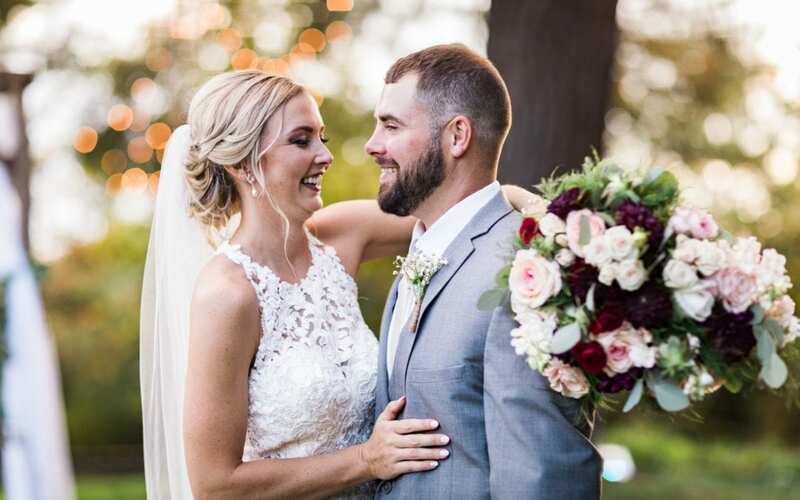 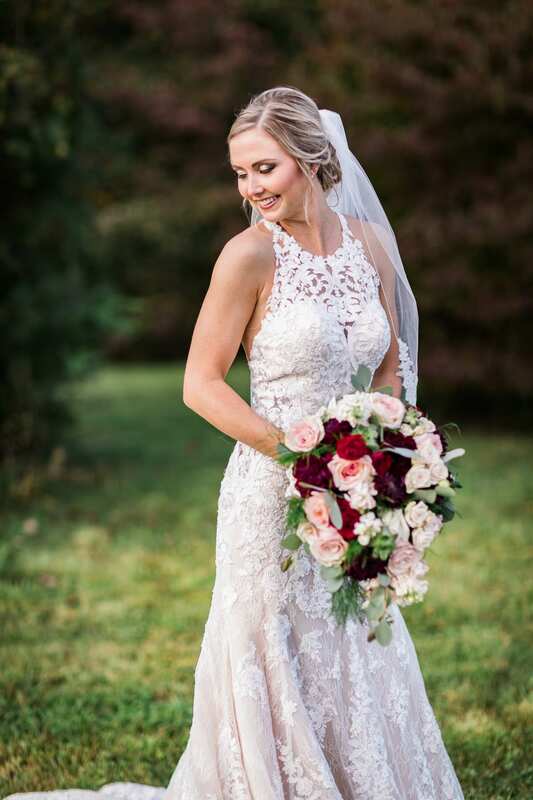 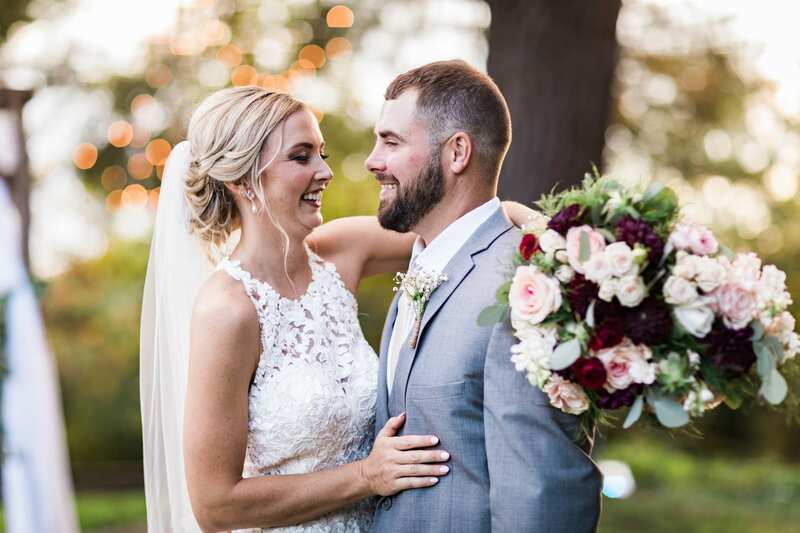 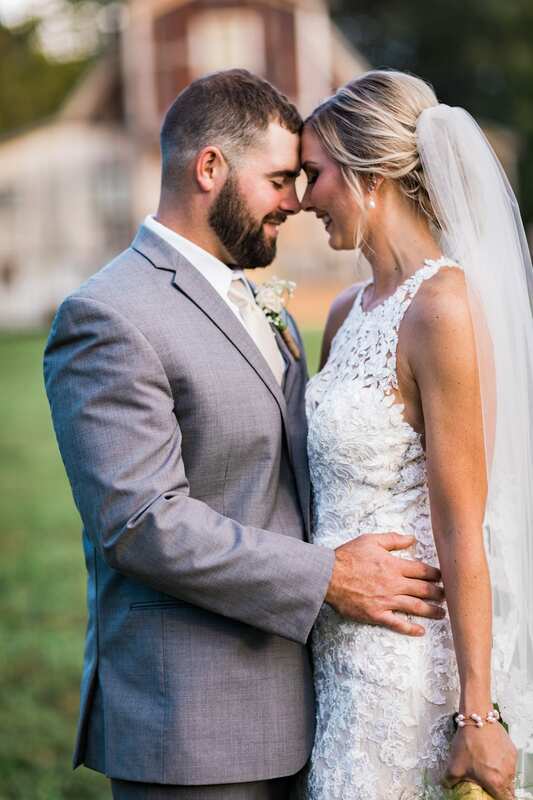 It’s hard to understate the charm of the bridal gown itself, with a lace halter neckline and inner sweetheart neckline, all over embroidery, and a fitted skirt. 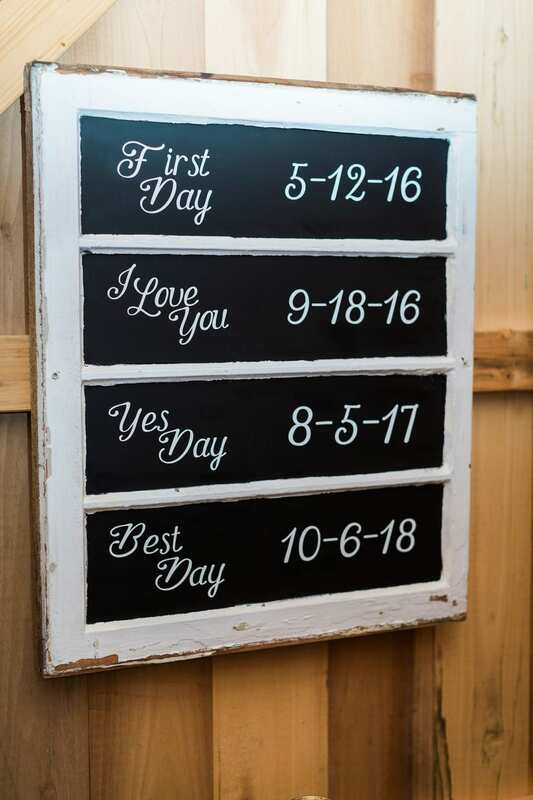 The sweep train added a dramatic but not overdone look as the newlyweds made their way back down the aisle. 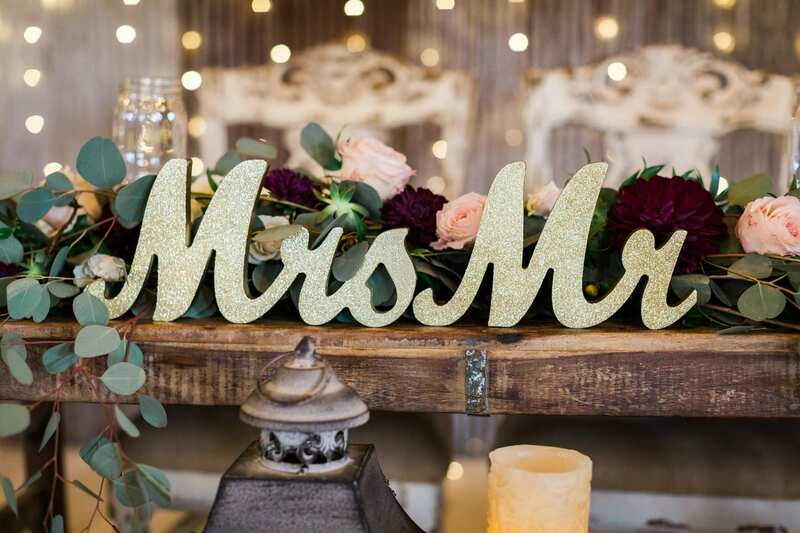 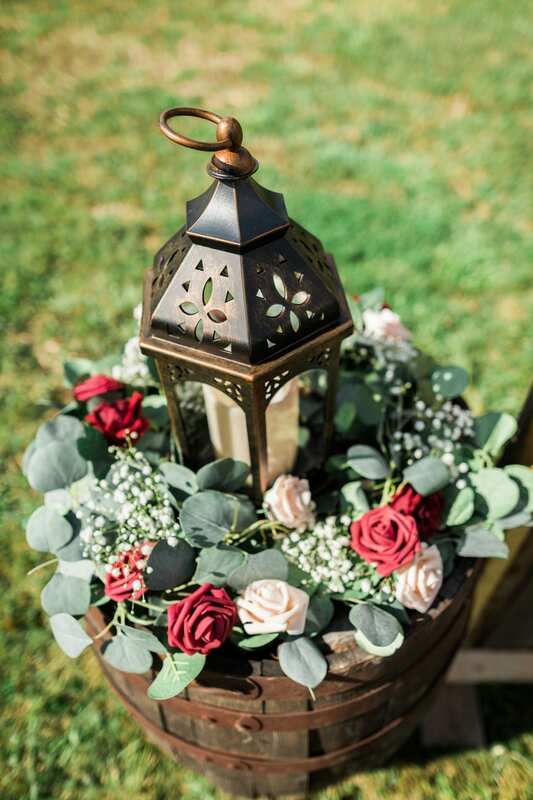 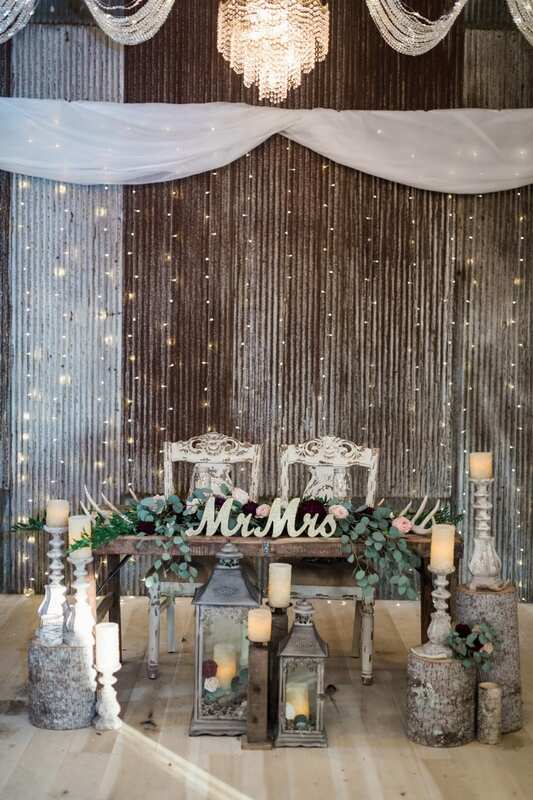 The reception was given a touch of glamour with string lights and tall but still rustic candlesticks. 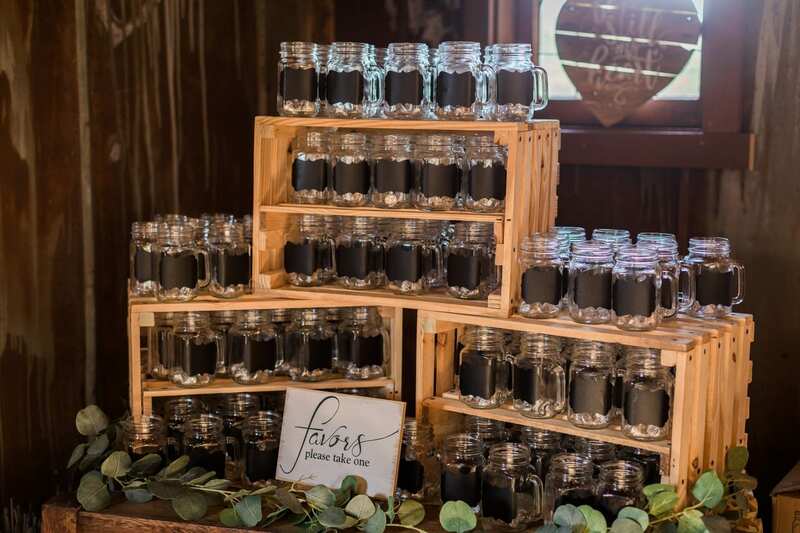 For a quirky dessert finale, the wedding cake and individual cupcakes were placed on tiered cake stands made from tree rings. 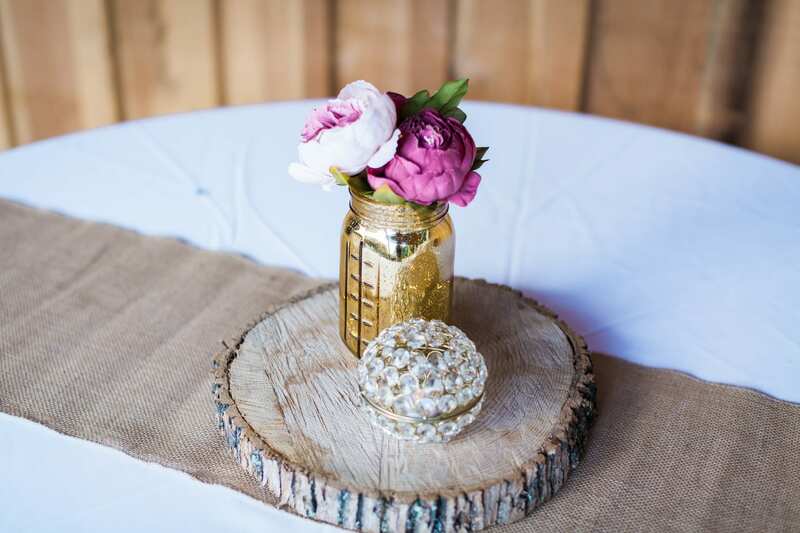 And there was plenty of dancing, with violet hued spotlights and some memorable dancing moves.